This page is a complete list of all 137 Boeing 737 write-offs. It should be said that there have been other accidents with more serious damage than some of these listed here, but if the aircraft was repaired they do not appear. Similarly some less serious accidents have resulted in a write-off because the operator could not, or did not, wish to pay for a repair. This is particularly true of 737-200's in recent years. There have been 150 737 hull-losses, including 4 hijackings/bombings and 7 ground accidents. This may sound high but remember that over 7000 737's have been built since 1967. This gives a 2.3% accident rate or approx 3 per year or one every 2.5 million flight hours. Furthermore, over 40% of occupants survive fatal 737 accidents. The table below shows that more accidents have befallen the older aircraft. This is to be expected because they have amassed more flying hours / cycles and later generations have 40 years of design and technology improvements built in to them. A fairer comparison across the generations would be rate per flying hours or cycles but I do not have the data for this. Details have been compiled from a variety of sources ie Aviation journals, books, news reports, internet sites (particularly the Aviation Safety Network) and of course the official accident reports, some of which is contradictory. Any additional information about any of these incidents would be gratefully received. 20 Apr 2012, AP-BKC, 737-200Adv, 23167/1074, FF 13 Dec 84, Bhoja Air; Islamabad, Pakistan. Crashed 2 miles short of the runway in thunderstorms, All 127 of the occupants died. 20 Aug 2011, C-GNWN, 737-200 Combi, 21067/414, FF 08 May 75, First Air; Resolute Bay, Canada. Crashed during approach to Resolute Bay in poor visibility and low cloud, 12 of the 15 occupants died. Overran Runway 06 (2270m) while landing in rain. Broke through the perimeter fence, fell onto a perimeter road and broke up, the front section separating just ahead of the wing root. 162 PoB, 2 serious injuries, no fatalities. 02 Nov 2010, PK-LIQ, 737-400, 24911/2033, FF 08 Apr 91, Lion Air; Pontianak, Indonesia. Overran Runway 15 (2250m) while landing in rain and high winds. It came to a stop in a field about 25 meters past the end of the runway all landing gear detached. No fatalities. 16 Aug 2010, HK-4682, 737-700W, 32416/1270, FF 21 Feb 2003, Aires; San Andres, Columbia. One passenger was killed and 34 were injured when lightning hit an airplane and caused it to split into at least two parts when landing early Monday on the island of San Andres, Colombia, Gov. Pedro Gallardo told CNN en Espanol. There were 131 people on-board the Aires airline 737-700 jet when it crashed around 1:50 a.m. (2:50 a.m. ET), the Colombian national police said. The flight had 121 adult passengers, four minors and six crew members, the police said. 22 May 2010, VT-AXV, 737-800W, 36333/2481, FF 20 Dec 2007, Air India Express; Mangalore, India. The aircraft overran the runway on landing and slid down a ravine, where it caught fire. 158 of the 166 occupants died. 13 Apr 2010, PK-MDE, 737-300, 24660/1838, FF 16 Mar 90, Merpati; Manokwari, Indonesia. The aircraft crashed into the Mediterranean shortly after take-off. Eyewitness reports seeing the aircraft in flames before impact. 8 crew and 82 passengers aboard.. The crew made an approach to Runway 12 during a rainstorm with a 14kt tailwind because the other end did not have an ILS. The aircraft landed 4100ft into the 8900ft runway and bounced before settling onto the runway. It overran the runway end at 62 kts and came to rest on a beach. The plane's fuselage was cracked, its right engine broke off from the impact and the left main landing gear collapsed. No fatalities. The Boeing 737 was flying from Bangui, capital of Central African Republic, to Zimbabwe for a maintenance check and was carrying 2 crew and 5 mechanics when it crashed at 0600h local time around 210 km (125 miles) east of Kinshasa. All 7 on board died. The aircraft was making a coupled ILS to runway 18R when the Captains radio altimeter erroneously indicated ground level. The autothrottle retarded the thrust levers as though for an autoland which was not noticed by the crew. 1m40s later at 100kts the stickshaker activated and the F/O started to recover; the Captain took control but did not notice the autothrottle again retard the thrust levers. The aircraft impacted tail first and broke into 3 pieces. 9 of the 134 on board died. The aircraft started to swung to the left at approx 90kts on its take-off roll. The crew aborted the take-off and the aircraft reached 119kts before departing the left side of the runway where it caught fire. No fatalities. The crew made a go-around from its first approach due to a flap problem. The crew made several orbits whilst executing the QRH, but appear to have forgotten to lower the undercarriage for landing. No injuries but the aircraft was an insurance write-off. The crew were approaching Perm at night and in cloud, with the autopilot and autothrottle disconnected when they became disorientated and lost control of the aircraft. The Russian investigators noted that the throttles had to be staggered to give equal thrust and that the crew were possibly fatigued and not used to the western artificial horizon display. All 82 passengers and 6 crew were killed. Official information about the investigation from the Russian MAK can be viewed here. The 30-year old Boeing 737-200 disappeared while en route from Maiquetia to Latacunga. It was being ferried to a new owner after storage at Caracas with 3 crew on board. The aircraft struck Iliniza volcano, elevation 17,000ft. There is no evidence of poor weather in the area around Latacunga Airport at the time. All 3 occupants were killed. The airplane had been landing towards northwest in heavy rain and marginal conditions, when the brakes failed. The airplane went about 250 meters past the runway and 3 meters below runway elevation. The right hand wing received damage, both engines and the main landing gear detached. Initial reports state that the flaps were at 15 and the thrust reversers were stowed. Jambi Sultan Taha has a single 2000 x 30m asphalt runway and no ILS. Passengers reported that the captain made an announcement before landing of a possible problem and "not to worry". Iran Aseman Airlines flight 6875 from Bishkek Manas, Kyrgyzstan to Tehran Iran was carried out by Itek Air. The aircraft was returning to Manas on a visual approach after developing a pressurisation fault shortly after takeoff. Preliminary FDR information suggests that the first approach was too fast (250kts at 6.5d and 185kts at 2.5d at 400m height). The crew made a left orbit with 30 degree bank and speed continued to decrease to 155kts. After a minute the plane was downwind at very low altitude. The plane contacted the ground 7.5km from Runway 08, with gear down and flaps 15. According to preliminary analysis of FDR and accident site there were no signs of a technical malfunction except for the original pressurization fault. 65 of the 90 persons on board died. Engine #1 caught fire shortly after docking destroying the aircraft. No fatalities. The cause was the detachment of a slat pylon bolt which fell off and pierced the fuel tank which leaked and ignited. According to the JTSB the washer that should have held the nut in place probably detached during maintenance 6 weeks before the incident. The design of the nut has since been changed to limit the likelihood of detachment. The aircraft took off from Douala, Cameroon at 00:05L in a rainstorm after waiting an hour for a thunderstorm to pass. At 1500ft the Captain called for the autopilot to be engaged but this did not happen. The aircraft slowly rolled rolled 35 degrees to the right when the crew noticed and rolled further right and pulled back. The aircraft reached 118 degrees AoB right and impacted at 48 degrees nose up and 3.75G. It is believed that the crew were not aware that the autopilot was not engaged and became disorientated. All 114 passengers & crew killed. After a high energy, unstabilized approach, the aircraft landed at a speed of 221kts with flap 5 set. It bounced twice, snapping off the nosegear and broke through the perimeter fence where it was destroyed by impact forces and subsequent fire. There were 21 fatalities and 50 serious injuries among the 133 people on board. Aircraft damaged beyond economical repair after a heavy landing in possible windshear. The aft fuselage bent down several degrees causing the fuselage to crack aft of the wings. The undercarriage remained intact. No fatalities. The aircraft touched down 20-30m short of the runway whilst landing in fog. It skidded along the side of the runway for a further 1,000m during which time the undercarriage and No2 engine detached. No fatalities. The aircraft was in the cruise at FL350 in marginal VMC conditions when it developed an IRS fault. The crew were preoccupied with the IRS malfunction for the last 13mins of the flight and subsequently lost control of the aircraft after one of the IRSs was switched to ATT. The aircraft reached 100deg bank, 60deg nose down and 3.5g; it broke up at 490kts in the dive. The aircraft had a history of "154 recurring defects directly and indirectly relating to the IRS between Oct and Dec 2006". All 96 passengers and 6 crew perished. The aircraft crashed shortly after taking-off from Abuja in a rainstorm. It came to rest about 1 mile from the end of the runway in several pieces. 96 of the 105 pax & crew perished. The aircraft collided with an Embraer "Legacy" executive jet at 37,000ft whilst en-route from Manaus to Brasilia. The Legacy landed safely but all 149 passengers and 6 crew aboard the 737 were killed. The 18 day old 737-800SFP had only flown 234 hours since new. Initial reports suggest that ATC believed the Legacy to have been at FL360, the correct FL for that direction. The transponder and TCAS of the Legacy was off or inop for at least 50 minutes before the collision. After an uneventful cargo flight from Liege, Belgium, with two flight crew on board, the aircraft entered a holding pattern, as the weather at its planned destination of Stansted precluded making an approach. Approximately 30 minutes later, the commander initiated a diversion to Nottingham East Midlands airport, where the weather conditions required the crew to plan and conduct a Category IIIA approach to Runway 27. In the late stages of this approach, the autopilot momentarily disengaged and re-engaged, and the aircraft deviated from both the glideslope and localiser. It landed heavily on a grass area to the left of the runway threshold, whereupon the right main landing gear detached from the aircraft. After scraping the right engine, outer flap track fairing and right wing tip on the ground, the aircraft became airborne again and made an emergency diversion to Birmingham Airport. The aircraft landed on Runway 33 on its nose and left landing gears, and the right engine. There were no injuries or fire. The aircraft took off from Lagos airport at 2045 local time in heavy thunderstorms. Three minutes later the aircraft made a distress call and was lost from radar. The wreckage was found in Lissa about 20 miles northwest of Lagos the following day. Fidelis Onyeyiri, director general of the Nigerian Civil Aviation Authority said, 24 hours after the crash, “Our preliminary appraisal suggests that the aircraft might have started stalling after passing flight level 130, lost control, then nosedived into the ground and created a huge crater into which it disappeared.” Eyewitness reports say the aircraft exploded before impact. On 12 Feb 2008, Samuel Oduselu, commissioner of the Accident Investigation Bureau, said the Nigerian police claimed they retrieved the black box of the aircraft shortly after the crash, but had yet to hand it over to the accident bureau. "The police said they found the recorder and we have been writing to them. Up to now, they cannot tell us the one they found, where it is and to whom they gave it," he said. There were several high ranking officials on board and accident investigators are not ruling out sabotage. All 111 passengers and 6 crew were killed. The aircraft sustained substantial damage after it overran runway 27 at Mumbai landing in poor weather. The gear collapsed and the aircraft became stuck in mud from which it took 2 days to move. No fatalities. The aircraft crashed shortly after take-off, 500m beyond the runway, into a residential area at 0940 local time. The crash killed 102 of the 117 people on board and at least 47 on the ground. The aircraft was approaching Pucallpa's runway 02 in a storm. The F/O was under training and had only 60h on type and the covering F/O was in the cabin rather than on the jump-seat. The aircraft descended to 987ft AGL and entered intense hail bombardment that caused the crew to lose situational awareness. Shortly after the crew disengaged the autopilot, the 737 entered a sharp descent exceeding 1,700ft/min and struck terrain 34s later, 3.8nm (7km) from the Pucallpa VOR, travelling 1,500m through trees. The accident killed 40 of the 98 persons on board. Peru's accident investigation board, the CIAA, attributed the crash to the crew's decision to continue the approach despite a non-stabilised approach. A "lack of airmanship", the absence of the assigned first officer, and a failure to adhere to standard operating procedures were contributing factors. The aircraft departed Larnaca at 06:07 GMT for Athens. As the aircraft climbed through 16 000 ft, the Captain contacted the company Operations Centre and reported a Take-off Configuration Warning and an Equipment Cooling system problem. At 06:26 the crew said that they had solved the problem and requested a climb to 34,000ft. Radio contact was lost with the aircraft at approximately 06:37, 30 minutes after its departure, although it did squawk 7700. Greek F16s intercepted the aircraft at 07:20 and reported that the Captain was not visible and that the F/O appeared to be slumped over the controls. Two mayday calls were recorded on the CVR at 08:54, some reports say that a cabin crew member with a PPL licence was in the flight deck at impact. The aircraft crashed into mountains at 09:03 GMT after running out of fuel approx 19NM North of LGAV near the village of Grammatiko, the passenger oxygen masks had deployed. All 115 pax and 6 crew died. Depressurisation is the probable cause but why the crew were not able to use their oxygen and descend the aircraft to safety is still a mystery. The FDR was recovered immediately but the CVR was in poor condition. Autopsies found that those crew and passengers examined were alive on impact possibly indicating that they suffered from a lack of oxygen and were unconscious. The same aircraft has had a history of pressurisation related problems and suffered a loss of cabin pressure on 20 Dec 2004 in flight from Warsaw to Larnaca. A summary report issued 10 Oct 2006 states "The direct causes were: 1. Non-recognition that the cabin pressurization mode selector was in the MAN (manual) position during the performance of the Preflight procedure, the Before Start checklist and the After Takeoff checklist. 2) Non-identification of the warnings and the reasons for the activation of the warnings (Cabin Altitude Warning Horn, Passenger Oxygen Masks Deployment indication, Master Caution). 3) Incapacitation of the flight crew due to hypoxia, resulting in the continuation of the flight via the flight management computer and the autopilot, depletion of the fuel and engine flameout, and the impact of the aircraft with the ground." It also acknowledges that a contributory cause was the "omission of returning the cabin pressurization mode selector to the AUTO position after non-scheduled maintenance on the aircraft". The crew were approaching Kabul which was in a snowstorm. They were told to expect a VOR/DME approach to Runway 29, descend to FL130 and maintain VFR. Three minutes later it disappeared from radar. The aircraft struck a ridgeline 50ft below the crest of the mountain ridge at 9600ft. The FDR did not record and the CVR was never found. All 104 pax and 8 crew died. The aircraft was making a normal landing at Banda Aceh airport when it hit a water buffalo that had strayed onto the runway. The port main gear collapsed and the port engine and landing gear were badly damaged. The Republic of Singapore Air Force was called in to use their Chinooks to “float” the aircraft off the runway using airbags. There were no injuries and the aircraft was declared a write off and scrapped several months later. The aircraft had a bird-strike in the area of the nose landing gear just before rotation from Amsterdam. The crew raised the gear and had no abnormal indications in the flight deck so they continued to Barcelona (their intended destination). During the landing roll the airplane started deviating to the left. The crew applied right rudder, braking and nose wheel steering tiller but could not keep the aircraft on the runway. It left the runway at around 100 knots, hit some obstacles from building works and suffered major damage. An emergency evacuation was carried out with minor injuries to some passengers. There was no fire but the airplane was subsequently declared a Hull loss. Examination of the aircraft revealed that the cables and pulleys of the Nose Wheel Steering (NWS) system sustained damage from the bird-strike, resulting in a left steering command after nose wheel touch down. (NWSB cable was found broken, and NWSA cable was found jammed in a pulley on the nose landing gear.) This resulted in loss of directional control after the rudder was no longer aerodynamically effective during landing rollout. Also, the cables were severely worn in the trunnion seal area. The Aircraft had just got airborne from Lungi airport in Sierra Leone's capital Freetown at 14:23 local time bound for Banjul. It crashed into a swamp three miles from the runway, leaving one wing partly submerged in mud. Eyewitness reports say that the left wing caught fire after take-off and that the left engine subsequently exploded shortly before impact. About 50 passengers were treated in hospital for shock and minor injuries but all 126 survived. The Aircraft departed from Runway 22L at Sharm el Sheikh. The weather was night visibility 10K+, 17C, light winds. The aircraft took off, climbed normally and began a left hand turn as scheduled. But at 2000ft the turn slowly reversed to the right until at its maximum altitude of 5460ft it was banked 50 degrees. It continued to roll to 111 degrees and 43 degrees nose down, rapidly loosing height and hit the sea at 416kts, 2 minutes after takeoff. No mayday call was made. The accident report was inconclusive. No technical fault was found with the aircraft but it is believed that the crew were not aware that the autopilot was not engaged and became disorientated. The Egyptian operated charter flight was bound for Cairo for a crew change and then on to Paris. All 135 pax and 13 crew died. The aircraft had been holding for approx 30 mins before making its approach due to heavy rain. It landed on Runway 16 (3000m) but overran by approx 500m, stopping beyond the airport boundary fence. The engines and landing gear separated from the airplane. No serious injuries to the 118 passengers and 6 crewmembers on board were reported. The investigation is being conducted by the government of Gabon. The aircraft was damaged beyond repair. 15 minutes after takeoff, the Captain reported an engine failure, and that it had been shutdown. He elected to return to Port Sudan. The crew made an ILS approach to Runway 35 but went around because they were right of centreline. Power was increased and the gear retracted but the aircraft appeared to have gone out of control during the go-around. The aircraft crashed in flat wasteland about 3 miles from the airport. Night visibility was 4000m in sand. 115 of the 116 people on board died. The sole survivor, a two year old boy lost a leg in the crash. The aircraft took-off at 150kt and the First Officer (PF) called for the undercarriage to be raised (but this was not done). Immediately after rotation, the first stage of the No1 engine (JT8D-17A) HP turbine suffered a major uncontained failure. Several seconds after the left engine failure, there was a significant unexplained power reduction on the No2 engine, and the Captain took control. He maintained the same rate of climb, but the speed decreased toward the stall and the aircraft descended, generating a GPWS “Don’t sink” alert. The aircraft was near MTOW and briefly became airborne reaching 400ft, then veered and stalled striking the airport perimeter fence tail-first 600 metres beyond the runway. Tamanrasset was hot and high, the runway elevation was 4500ft with an OAT of 23C. The Captain came under scrutiny in the report for various aspects of his operation. Most importantly as to why he took control from the F/O (who had 5000hrs experience) 8 sec after the engine failure and allowed the speed to decay to the stall with the same rate of climb being maintained. He also did not retract he gear on the F/O's request after take-off nor did he allow her to retract the gear after he had taken control. 102 of the 103 people on board died. The sole survivor was a young soldier, seated in the last row and with seat belt unattached, who according to his statement, was ejected from the plane by the impact and escaped from the accident. The First Officer (PF) was approaching Runway 06 at Rio Branco Airport when it flew into fog. The crew continued the approach below MDA and collided initially with a tree and then touched down 100 meters short of the threshold. At the time of impact, both engines cut out and the Captain took control. The aircraft skidded some 600 meters and came to rest on the taxiway. The undercarriage was torn off and the aircraft struck several small trees causing damage to both engines, forward & mid fuselage and horizontal stabilizers. No injuries. Weather was foggy and rainy at the time, with a sandy wind, called the “Khamsin,” blowing from the Sahara desert. The aircraft was descending from FL320 when the aircraft entered a heavy thunderstorm with both engines at flight idle. Both engines lost power while passing FL180 in heavy precipitation and turbulence. Three unsuccessful attempts were made to relight the engines and one unsuccessful attempt was made to relight the APU. The crew then decided to carry out a flaps and gear up emergency ditching in a shallow, 1 metre deep, part of the Benjawang Solo River. One stewardess was killed in the rear of the aircraft which broke off during touchdown. Similar occurrences (Boeing 737-300 double engine flameout while descending in heavy precipitation with engines at flight idle) happened May 24, 1988 and July 26, 1988. Following these incidents OMB 89-1 & AD 89-23-10 were issued to require minimum rpm of 45% and to restrict the use of autothrottle in moderate/heavy precipitation; engine modification was provided for increased capacity of water ingestion. eg spinner redesigned. The First Officer (PF) started the take-off run. The Captain called “V1” and “ROTATE” and the FO rotated the control column to 15deg nose up. The aircraft’s nose was lifted up but the aircraft did not get airborne. The FO felt the stick shaker. The Captain added power which increased the speed to V2+15 (158kts) but the aircraft still did not get airborne. The Captain aborted the take-off but the aircraft nose went down hard and opened the front left door. The aircraft veered to the right of the approach lights and stopped after hitting trees 275 meters from the end of runway. The crew did not perform Before Take-off Checklist properly and inadvertently tried to take-off with flap up rather than the scheduled flap 5. There was no take-off config warning because the associated CB was found to be unable to latch in. No fatalities. Heavy landing during rain at Santa Genoveva airport. The aircraft touched the left side of the runway with the right landing gear, at 500 meters (1,640 feet) from Runway 14, and then touched with the left gear, leaving the runway right after that, when it collided with the landmark electricity boxes. The aircraft had its nose gear retracted; suffered a break in the right landing gear and thus a loss of the right engine. With this, it ended up by touching the ground with the tip of the right wing. No fatalities. As the aircraft approached Yellowknife, the spoilers were armed, and the aircraft was configured for a visual approach and landing on Runway 33. The computed Vref was 128 knots, and target speed was 133 knots. While in the landing flare, the aircraft entered a higher-than-normal sink rate (1140fpm reducing to 400fpm at touchdown), and the pilot flying (the First Officer) corrected with engine power and nose-up pitch. The aircraft touched down on the main landing gear and bounced twice. While the aircraft was in the air, the captain took control and lowered the nose to minimize the bounce. The aircraft landed on its nose landing-gear, then on the main gear. The aircraft initially touched down about 1300 feet from the approach end of Runway 33. Numerous aircraft rubber scrub marks were present in this area and did not allow for an accurate measurement. During the third touchdown on the nose landing-gear, the left nose-tire burst, leaving a shimmy-like mark on the runway. The aircraft was taxied to the ramp and shut down. The aircraft was substantially damaged. There were no reported injuries. The weather at St John's was as follows: wind 050/35G40kts; visibility 1 statute mile in light snow and blowing snow; ceiling 400 feet overcast; temperature -1ºC; dew point -2ºC. The crew decided to make an ILS approach onto Runway 16 since it was the only runway with a servicable ILS. The aircraft touched down at 164 KIAS (Vref +27Kts), 2300 to 2500 feet beyond the threshold. Radar ground speed at touchdown was 180 knots. The wind at this point was determined to be about 050ºM at 30 knots. Shortly after touchdown, the speed brakes and thrust reversers were deployed, and an engine pressure ratio (EPR) of 1.7 was reached 10 seconds after touchdown. Longitudinal deceleration was -0.37g within 1.3 seconds of touchdown, suggesting that a significant degree of effective wheel braking was achieved. With approximately 1100 feet of runway remaining, through a speed of 64kts, reverse thrust increased to about 1.97 EPR on engine 1 and 2.15 EPR on engine 2. As the aircraft approached the end of the runway, the captain attempted to steer the aircraft to the right, toward the Delta taxiway intersection. Twenty-two seconds after touchdown, the aircraft exited the departure end of the runway into deep snow. The aircraft came to rest approximately 75 feet beyond and 53 feet to the right of the runway centreline on a heading of 235ºM. One engine was sheared off and one main gear was damaged. The 737 has been written off. No fatalities. The flight was being prepared by 5 cabin crew members and 3 ground staff members for a flight to Chiang Mai. The Thai Prime Minister was one of the 149 passengers waiting to board the plane. 27 minutes before scheduled departure time, a fire erupted in the cabin, killing a flight attendant and injuring 6 others. The fire was put out in an hour, but by then the aircraft had been gutted. Subsequent investigation discovered that the centre tanks pumps had been left running when tank was dry which caused the explosion. Accident very similar to Philippine Airlines 737-300 accident on 5 Nov 90. The aircraft was inbound to Patna. It was cleared for the VOR/DME arc to ILS Runway 25. The crew took a direct track to the intercept and ended up high on the approach. 30 seconds before impact they requested an orbit to lose height and hit the ground in the orbit. The CVR recorded the stick-shaker in the orbit suggesting that the aircraft stalled. The aircraft crashed into a residential area about 2 km from the airport. All six crew members and 49 passengers were killed. Five people on the ground were also killed. The aircraft had gone around from an ILS approach onto Runway 05 at Francisco Bangoy Airport in Davao because of an aircraft on the runway. The crew requested a VOR/DME onto Runway 23 and was cleared to do so. The aircraft hit a hill on Samal Island at 570ftamsl at 7dme on the non-precision approach and was destroyed by impact forces and a post-accident fire. All 7 crew and 124 passengers were killed. Aircraft had been held high by ATC and eventually touched down at 181kts deep into an 1840m runway. The aircraft overran and went through the perimeter fence at 32kt coming to a halt at a petrol station. The NTSB determined that the probable cause of a Southwest Airlines accident was the flight crew’s excessive airspeed and flight path angle during the approach and landing at Burbank, California. The Board also attributed the cause of the accident to the crew’s failure to abort the approach when stabilized approach criteria were not met. The aircraft settled back onto the runway just after takeoff, overran the runway, hit two cars on a nearby road, and caught fire. The crew had not selected take-off flap and had continued the takeoff despite the take-off configuration warning horn sounding for the entire 37 second take-off run. There were 65 fatalities among the 98 passengers and five crew members. Two of the occupants in the cars were also killed. The aircraft skidded off the runway at Zhanjiang Airport, probably due to the bad weather and heavy rain. The landing gear collapsed after exiting the runway. No fatalities. One of the fuel tanks burst open during fuelling of the aircraft. The aircraft was damaged beyond repair. The aircraft was on a training flight when it overran the runway. The nose-gear collapsed. Grass near the aircraft caught fire causing the airplane to burn out. No fatalities. The Boeing 737 departed Adana at 00.36h for a ferry flight to Jeddah to pick up Turkish pilgrims. Weather was poor when the plane crashed, nine minutes after takeoff. All 6 occupants were killed. The severe weather conditions probably contributed to the cause of the accident. The pitot static anti-ice system was probably not activated during preparations for flight because of missed checklist items. The crew failed to recognize the cause of an erratic airspeed indication. The crew failed to use other cockpit indications for control and recovery of the airplane. The presence of cabin crew in the cockpit probably distracted the attention of the cockpit crew. The aircraft was approaching Runway 27 at night with reported wind 280/15G30kt and turbulence. The approach was stable but a gust from the right was encountered below 100ft RA. The aircraft touched down softly (1.1G) 5m left of centreline, with its left main gear which delayed deployment of the spoilers by two seconds until the right MLG touched down. Directional control was lost and the aircraft ran off the side of Runway 27. The nose-gear dug into the ground and collapsed. No fatalities. Damaged after landing with engine failure at Kilimanjaro Airport. No injuries. Aircraft ferried to Harare for D check, but considered damaged beyond economical repair. Shortly after takeoff from Runway 8R, the crew reported a hydraulic problem and declared an emergency. The aircraft was vectored to a visual approach and landing on Runway 9L. During the landing, while decelerating through 100 knots, the aircraft's steering system failed due to hydraulic pressure, and the aircraft departed the left side of the runway, coming to rest between Runway 9L and Taxiway L. Mechanical failure. No injuries. After executing a missed approach on their first ILS approach to Runway 28, the flight was vectored for a second approach to the same runway. The second approach was reported by both pilots to be uneventful; however, after touchdown, the aircraft drifted to the left side of the runway. The left main landing gear exited the hard surface of the runway approximately 2,700 feet from the landing threshold and eventually all 3 landing gears exited the 197 foot wide asphalt runway. The First Officer, who was flying the airplane, stated that he never felt any anti-skid cycling during the landing roll and did not feel any “radical braking” which was expected with the autobrake 3 setting. The airplane's nose landing gear collapsed resulting in significant structural damage. A total of 15 runway lights on the southern edge of runway 28 were found either sheared or knocked down. There were no injuries. The tower operator reported that intermittent heavy rain showers accompanied with downdrafts and strong winds associated with a thunderstorm northeast of the airport prevailed throughout the area at the time of the accident. The two transport category airplanes that landed prior to Continental flight 475 reported windshear on final approach. The winds issued to Continental 475 by the tower while on short final were from 360 degrees at 20 kts, gusting to 40 kts. The Boeing 737 suffered hydraulic problems shortly after takeoff. The crew elected to return to Khartoum. Upon landing one of the tires burst. The crew, hearing the bang thought it was an engine malfunction and deactivated the thrust-reversers. The 737 overran the runway and came to rest in a ditch. No fatalities. The aircraft crashed near the Andoas airport during an NDB approach, in a rainstorm, after a flight from Iquitos. The aircraft had been leased by Occidental Petroleum from the Peruvian Air Force in order to ferry its workers to the Andoas area. Five of the seven crew members and 69 of the 80 passengers were killed. Overran at 80kts after a heavy landing on a wet runway. No fatalities. Burst a tyre on landing during training flight. Aircraft caught fire and written off. No fatalities. Damaged beyond economical repair by a 104mph tornado whilst on ground at Miami airport. No fatalities. SilkAir Flight 185 was en-route to Singapore from Jakarta. While cruising at FL350, the aircraft disappeared from radar screens and was seen crashing nose-down into the river bed of the River Musi. One of the wings is understood to have broken off during the dive. The FDR was retrieved 27 December and the CVR January 4, both were buried in the mud of the river bed. Sections of the aircraft's empennage were found on land, away from the main wreckage. Investigators found more than 20 screws missing on the top and bottom of the right-hand horizontal stabilizer where the leading edge attaches to the front spar. It appeared that the fasteners were never installed. The stabilizer may have separated in flight, causing the plane to lose control. The FAA issued an AD January 8, 1998 requiring operators of Boeing 737s to check the horizontal stabilizers to make sure that all fasteners and elevator attachment fitting bolts are properly in place. Due to other circumstances, many people also suspect suicide by the Captain. All 7 crew members and 97 passengers were killed. At 95kts on the take-off run, the crew noted that the No2 engine thrust suddenly increased. At 120kts the EGT warning light illuminated. The Captain attempted to reduce thrust of the No2 engine but was unable to do so; he aborted the take-off. The thrust reversers did not deploy and the aircraft overran the runway. The gear and No2 engine detached as the aircraft ground looped and caught fire. No fatalities. The take-off from Runway 30 was abandoned following a tyre burst at 110kts. The aircraft skidded off the runway into shrubs and was engulfed in smoke when coming to rest 130m past the runway. No fatalities. The aircraft made a heavy landing at night during a rainstorm at Shenzhen-Huangtian airport, pushing the nose-gear up into the fuselage. The crew performed a go-around and tried to land 9 minutes later. After the 2nd touchdown the aircraft broke up in three pieces. It veered off the runway and caught fire. Two of the nine crew members and 33 of the 65 passengers were killed. The aircraft touched down at Carajas' Runway 10 in bad weather (thunderstorm, bad visibility) following a VOR approach. The right main-gear collapsed rearwards, causing the plane to veer off the right side of the runway, 700m from the point of touchdown. The aircraft ended up in a forest. The First Officer was the only fatality. Take-off aborted due to difference in engine N1 readings. The aircraft overran by approx 40m. The nose-gear collapsed. No fatalities. The aircraft crashed into a hill at 2300ft while making an NDB approach to Runway 12 in IMC conditions. It was 1.7nm left of the extended centerline and 1.8nm North of the runway, at a speed of 133kts and a 118 degree right bank. It appeared that the aircraft had strayed off course because the aircraft flew a 110 bearing instead of 119, after passing the KLP beacon (final approach fix). Weather at the time was 8km in rain; wind 120/12kts; cloud base 120m broken and 600m overcast; temp 12C. All 6 crew members and 29 passengers were killed, including the U.S. Secretary of Commerce, Ron Brown. The aircraft was on a scheduled domestic night flight from Lima to Arequipa. When doing a VOR/DME approach to Runway 09, the aircraft crashed into a hillside at 3 miles out, at an altitude of 8015ft - almost 400ft below the airfield elevation of 8404ft. It appeared that the pilot reported flying at 9500ft, but was actually at 8644ft. Visibility was given as between 2000 and 4000m and the FDR showed that the aircraft had been well below the published approach path for some distance before impact. All 117 passengers and six crew members were killed. The aircraft was on a flight from Cotonou, Benin and crashed in darkness in a steep dive about three miles (4.8 km) short of the runway in a mangrove swamp. The crew members had reportedly aborted the first approach due to landing gear problems and they were on a go-around from their second approach when the accident occurred. It appeared that the aircraft was carrying out a go-around and that the No.2 engine was operating at high power while the No.1 engine was not developing power. Four of the six crew members and 68 of the 72 passengers were killed. At 12.56h LT flight IC492 arrived from Bombay and Jaipur, but touched down just 600m before the end of the runway and overran by 450m. Both engines, all undercarriage and the wings sustained major damage. No fatalities. Flight WT 357 touched down more than half way down Kaduna's Runway 23 in good, dry weather but with a 10-15kt tailwind. The plane veered off the left side, skidded sideways and came to rest 35m beyond the end of the runway. A fire broke out on the dry grass under the aircraft on the right hand side and destroyed it. Nine of the 129 passengers were killed. Flight GUG901 encountered heavy rain & thunderstorms while approaching San Salvador at night. The crew diverted off Airway G346 to avoid the thunderstorms but the accident report states that the aircrafts DME had been damaged by a lightning strike. The aircraft should then have passed overhead the airport and turn right downwind for an ILS approach to Runway 07. There seemed to be some confusion as to the position of the aircraft. The aircraft was at 5000ft, as cleared by ATC, when the GPWS sounded. Full power was applied, but the aircraft struck Mt. Chinchontepec volcano (2181m high) at an altitude of 1800m. All 7 crew members and 58 passengers were killed. The accident report attributes the let-down error to the pilots’ failure to realise that the DME readouts were incorrect. Aircraft departed Sao Paulo-Guarulhos for a flight to Buenos Aires. Following flap retraction the No.3 flap IN TRANSIT light remained on and the crew noticed some other problems: They were not able to reduce No.2 engine thrust below 1.15 EPR and the hydraulic system A suffered a pressure loss. An emergency return was made and the aircraft touched down on Runway 09L at 185kts, flaps 15. 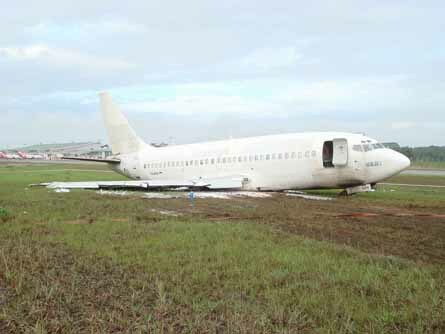 The 737 overran the runway by 200m and came to rest following a collapse of the nose-gear and right hand main gear. It appeared that the No.3 leading edge flap actuator attachment fitting on the wing front spar had fractured due to corrosion. The actuator came away and caused the failure of some hydraulic lines and damage to the thrust control cables. Some 1981 Boeing Service Bulletins had not been complied with. One of these included the replacement of the aluminium leading edge flap actuator attachment fitting with a steel one; this had not been done. No fatalities. Flight SG416 landed on Runway 09 (1858m long) with flap 30 at Yokyakarta, which was wet with pools of standing water after a thunderstorm. It overran the runway by 100m and the nose-gear collapsed. No fatalities. The aircraft landed heavily in bad weather. The crew lost control and the aircraft ran off the side of the runway. This resulted in a nose-gear collapse and both engines were torn away. No fatalities. The aircraft hit a hill 4km from the airport during the fourth VOR/DME approach in snow (900m visibility, reducing to 300m in driving snow). Six of the seven crew members and 49 of the 55 passengers were killed. The aircraft had left Amsterdam at 07.42h but had to divert East Midlands due to bad weather at Coventry. After awaiting better weather, the flight took off again at 09.32h. While approaching Runway 23 the aircraft descended below MDA, clipped the roofs of two houses, rolled and crashed inverted into a wood. Flight 427 was approaching Pittsburgh Runway 28R The aircraft was levelling off at 6000ft & 190kts and rolling out of a 15deg left turn (roll rate 2deg/sec) with flaps at 1, the gear still retracted and autopilot and auto-throttle systems engaged. The aircraft then suddenly entered the wake vortex of a Delta Airlines Boeing 727 that preceded it by approx. 69 seconds (4,2mls). Over the next 3 seconds the aircraft rolled left to approx. 18deg of bank. The autopilot attempted to initiate a roll back to the right as the aircraft went in and out of a wake vortex core, resulting in two loud “thumps”. The First Officer then manually overrode the autopilot without disengaging it by putting in a large right-wheel command at a rate of 150deg/sec. The airplane started rolling back to the right at an acceleration that peaked 36deg/sec, but the aircraft never reached a wings level attitude. At 19.03:01 the aircraft's heading slewed suddenly and dramatically to the left (full left rudder deflection). Within a second of the yaw onset the roll attitude suddenly began to increase to the left, reaching 30deg. The aircraft pitched down, continuing to roll through 55deg left bank. At 19.03:07 the pitch attitude approached -20deg, the left bank increased to 70deg and the descent rate reached 3600fpm. At this point, the aircraft stalled. Left roll and yaw continued, and the aircraft rolled through inverted flight as the nose reached 90deg down, approx. 3600ft above the ground. The 737 continued to roll, but the nose began to rise. At 2000ft above the ground the aircraft's attitude passed 40deg nose low and 15deg left bank. The left roll hesitated briefly, but continued and the nose again dropped. The plane descended fast and impacted the ground nose first at 261kts in an 80deg nose down, 60deg left bank attitude and with significant sideslip. All 132 aboard died. The aircraft landed fast and long on Runway 03 in thunderstorms and rain. It overran across soft ground and struck approach lights and the ILS antenna. The nose-gear collapsed and was pushed into the avionics bay. No fatalities. A Training Captain and three new pilots were performing circuits for crew training. During the sixth take-off the instructor pilot apparently decided to introduce a simulated engine failure. This had not been pre-briefed. The aircraft attained a steep nose-up attitude and the left wing dropped. The aircraft crashed and slid into a parked Ilyushin 86 airliner. Both aircraft burned out. All 4 occupants and 5 persons on the ground were killed. The aircraft touched down in a crosswind following an ILS approach onto Runway 03R, but wasn't properly aligned with the runway. The 737 then departed the runway 2500ft past the threshold and crossed taxiway H. The nose-gear collapsed. Weather was bad with low clouds, turbulence and rain. No fatalities. This was the only 737-100 ever to be written off. The aircraft collided with a ridge of the Mount Ungeo (1050ft high) at an altitude of 800ft, in strong winds & heavy rain about 4nm from the runway while it was making its third attempt at a VOR/DME approach into Mokpo. Four of the six crew members and 64 of the 104 passengers were killed. The aircraft landed heavily on Runway 09, skidded to the right off the runway. The nose-gear collapsed and both engines were torn off. The aircraft came to rest 200ft right of the runway. The weather was bad at the time of the accident with heavy rain and lightning. No fatalities. The aircraft failed to climb after take-off with weight about 2000kg (4400lbs) above RTOW for the conditions (OAT 40C). It struck a large vehicle on a road just outside the airport with its landing gear. The vehicle strike also damaged one engine and the aircraft later hit power lines and crashed 7km from the airport. Four of the six crew members and 52 of the 112 passengers were killed. Maintenance deficiencies were found including the fact that the aircraft was despatched with an unserviceable FDR. Both pilots were charged with negligence. The administrators of the airport were also cited for failing to regulate traffic on that same road. On approach the aircraft pitched violently up and down several times, appeared to go out of control and crashed. The stabilizer was said to have been mis-trimmed, but the cause is not known. The aircraft tech log showed recent problems with horizontal stabilizer control, which were being investigated at the time by Boeing. All 6 crew killed. Aircraft hit high ground at 7000ft (500ft below MSA) during approach to Runway 36. A serious vibration had reportedly occurred in the No 2 engine before the aircraft crashed in a steep right hand turn. FDR data indicates that the aircraft levelled off at 7200ft during a descent towards the airport with the autopilot and autothrottle engaged, the left throttle lever advanced but the right did not. The FDR also indicated that the same problem had occurred earlier in the same flight and had been corrected manually. All 8 crew members and 133 passengers were killed. The aircraft had previously made a heavy landing which was inspected by an engineer on the turnaround. The aircraft back-tracked Runway 18 for departure, but tyre marks on the runway showed that the number 3 & 4 tyres had locked up during the line-up. During the take-off run, No3 tyre lost pressure and No4 tyre burst just before V1. The aircraft began vibrating and pulling to the right. The take-off was aborted and the aircraft overran by 125m and caught fire. No fatalities. During the descent to Cruzeiro do Sol, the crew's attention was distracted by the cargo compartment warning system, which began to activate intermittently. The aircraft crashed in the jungle while performing a Delta 1 arrival. All 3 crew on board were killed. Twenty minutes after leaving Panama City at FL 250, the crew became disorientated when the artificial horizon failed. The aircraft rolled through 90deg, entered a steep dive and broke up at approximately FL130. The aircraft entered an area with thunderstorms, but it is not known if it sustained a lightning strike. However, a wire from the gyroscopes to the instruments had frayed, creating a short circuit and was giving erroneous attitude indications. The aircraft, although in VMC, was flying over featureless woodland at night and the crew were unable to determine the aircrafts attitude. All seven crew members and 40 passengers were killed. The aircraft appeared to be left of the centerline during the final stages of the ILS approach. The crew made a correcting manoeuvre, which resulted in the aircraft landing on the right main gear first. The right main gear collapsed, followed by the left gear. The aircraft crashed into a hill about 30km from the airport while positioning for a Runway 04 ILS approach. The pilot had extended the outbound leg too far, flying over mountainous terrain. All six crew members and 63 passengers were killed. The aircraft departed from controlled flight approximately 1,000 feet above the ground and struck an open field on approach to Colorado Springs. All 25 people on board were killed. After a 21-month investigation, the Board issued a report on the crash in December 1992. In that report, the NTSB said it “could not identify conclusive evidence to explain the loss of the aircraft”, but indicated that the two most likely explanations were a malfunction of the airplane’s directional control system or an encounter with an unusually severe atmospheric disturbance. The NTSB has since adopted a revised final report on this crash. The Board said that the most likely cause of the accident was the movement of the rudder in the direction opposite that commanded by the flight crew. The decision tracks information learned from the investigation of two fatal 737 accidents - including this one - and a non-fatal incident. US Air flight 1493 entered LAX airspace around 17.57 and was cleared for a profile descent and ILS Runway 24R approach. At 17.59 this was changed to a Runway 24L approach clearance. At about the same time a SkyWest Metro II aircraft (Flight 5569 to Fresno) taxied to Runway 24L. At 18.03 the crew were advised to, “taxi up to and hold short of 24L” because of other traffic. At 18.04:49 the flight was cleared to taxi into position and hold. Immediately thereafter, the controller became preoccupied with instructing WingsWest Flight 5006 who had unintentionally departed the tower frequency. The WingsWest 5072 reporting ready for takeoff caused some confusion because the controller didn't have a flight progress strip in front of her. The strip appeared to have been misfiled at the clearance delivery position. Meanwhile, Flight 5569 was still on the runway at the intersection with taxiway 45, awaiting takeoff clearance. At 18.07 Flight 1493 touched down. Simultaneous to the nose-gear touchdown, the US Air B737 collided with the SkyWest Metro. Both aircraft caught fire and slid to the left into an unoccupied fire station. Two of the six crew members and 20 of the 83 passengers on the USAir jet were killed. All 10 passengers and two crew members on the Metro III were killed. The centre fuel tank exploded while the aircraft was taxiing for departure. 8 of the 113 passengers were killed. The airline had fitted logo lights after delivery which involved additional wires to be passed through vapour seals in the fuel tanks. The NTSB recommended to the FAA that an AD be issued requiring inspections of the fuel boost pumps, float switch and wiring looms as signs of chafing had been found. The FAA declined to issue the AD. A hijacker detonated a bomb during approach, causing the 737 to hit parked aircraft on the ground. Seven of the nine crew members and 75 of the 93 passengers were killed. The hijacker had ordered the flight crew out of the cockpit except for the Captain. He refused an offer from the Captain to fly to Hong Kong and the dispute continued until the fuel was nearly exhausted, necessitating the landing. Shouts and sounds of a struggle were heard from the cockpit during the approach. The aircraft landed hard and veered off the runway and clipped a 707 and a 757 before coming to a halt upside down in a grassy area. The No.1 engine accelerated beyond target EPR on take-off. The crew aborted the take-off, but the No.1 engine didn't respond to the retarded power lever, so had to be shut down with the fuel shut-off lever. Asymmetric thrust was controlled with nose wheel steering. The nose-gear wheels separated from the gear before the aircraft was brought to a halt. No fatalities. The aircraft crashed about 7.5 miles short of Runway 14, Unalakleet, Alaska, while executing a localizer approach to that runway in IMC. There were no passengers on board but the crew sustained injuries and the airplane was destroyed. The NTSB determines that the probable cause of this accident was deficiencies in flightcrew coordination, their failure to adequately prepare for and properly execute the UNK LOC Rwy 14 non-precision approach, and their subsequent premature descent. The Safety Board issued a safety recommendation on approach chart standardization to the FAA. While descending to Tucson, a 115Volt AC wire of the No.2 B hydraulic pump shorted and punctured a hydraulic system A line. As the aircraft was approaching the airport a fire erupted and burned through to the electrical power wires to the standby hydraulic pump. After landing at Tucson, the aircraft overran the runway, collided with an abandoned concrete arresting gear structure, shearing off the nose-gear and continued to slide for 3,803ft. The aircraft had flown 62,466hrs and 38,827 cycles. PROBABLE CAUSE: Mechanically worn thrust reverse accumulator check valve and inboard brake isolation check valve. The crew were using the wrong SID, causing the aircraft to make a left instead of right turn and hit cloud shrouded high ground at 7000 feet. All 7 crew members and 49 passengers were killed. The aircraft swung to the left during the F/O's takeoff, the Captain aborted at Vr+5. Auto-throttle was not used and autobrake RTO mode had not been selected both of which increased the accelerate-stop distance. The aircraft overran the wet runway and dropped onto the wooden approach light pier, which collapsed causing the aircraft to break into three and drop into 7-12m deep East River. Two of the 55 passengers were killed. The swing was caused by the rudder trim having been placed unintentionally at 16 degrees (full) left position. This could have been caused by the foot of the jumpseat passenger on the centre console or the knob could have stuck whilst being moved. Boeing have since redesigned the rudder trim knob to a cylinder rather than a blade and placed a rim around the console. The pilot set a heading of 270 instead of 027 and ended up 600 miles off course. The error led to fuel exhaustion and a forced landing in jungle, 12 of the 48 passengers were killed in the crash. It took two days for the survivors to be found. The heading mistake went unnoticed because the crew was reportedly listening to the Brazil v Chile World Cup qualification football match. Aircraft landed in stormy weather and the gear collapsed. Aircraft slid off the runway and the No.2 engine separated. No fatalities. Overran on landing in a rainstorm. One engine separated from the wing. No fatalities. 13 minutes after take-off from LHR, while climbing through FL283, moderate to severe vibration was felt, accompanied by a smell of fire in the cockpit. The outer panel of one of the No.1 engine fan-blades detached, causing compressor stalls and airframe shuddering. Believing the No.2 engine had been damaged the crew throttled it back. The shuddering stopped and the No 2 engine was shut down. The crew then decided to divert to East Midlands. The flight was cleared for a Runway 27 approach. At 900ft, 2.4nm from the runway, engine No.1 power suddenly decreased. As the speed fell below 125kts, the stick shaker activated and the aircraft struck trees at a speed of 115kts. The aircraft continued and impacted the embankment of the M1 motorway and came to rest against the wooded embankment, 900m short of the runway. 47 people were killed. The engine was a CFM56-3C1 at 23,500lbs and failed after only 500hrs, this was followed by several other failures of the 3C1 which ran at higher rotational speeds than previous CFM56s. The engines were then derated down to 22,000lbs until a permanent cure was found. The aircraft was approaching Runway 23 in fog when it hit trees and an electric pylon three miles (5km) out on approach. All six crew members and 124 of 129 passengers were killed. The aircraft landed in heavy rain and overran the runway. The nose and right main gear both collapsed. No fatalities. The runway in use at Ushuaia was 16 with a wind of 230/12. However during the approach the wind changed to 360/20 so the crew elected to use Runway 34, despite being warned of possible windshear for that runway. The aircraft touched down hard (1.89G) 12kts fast, bounced and landed back 3/4 of the way down the 1400m runway. It then veered off and went down a slope into 2m deep water. No fatalities. During take-off, just past VR, at a speed of 146kts, the 737 suffered a birdstrike. Both engines ingested a number of birds, which resulted in a rise in engine temperature on climb-out and the engines backfiring at 100-200ft. The crew made a right turn to return to the airport with the EGT at limits. On base leg at 7100ft amsl with 190kts, both JT8D-17A engines backfired & flamed out. A wheels-up crash landing was made. The aircraft caught fire. The aircraft had been delivered on October 29, 1987 and had accumulated just 1377hrs flying time and 1870 cycles. PROBABLE CAUSE: “The accident occurred because the airplane could not be safely returned to the runway after the internal destruction and subsequent failure of both engines to operate arising from multiple bird ingestion by both engines during take-off.” Engine failure due to ingestion of 10-16 Columba Guinea birds (approx. 320 grams each). As a result of the crash landing, 31 of the 105 passengers were killed. The aircraft experienced an explosive decompression at 24,000ft due to metal fatigue in upper cabin area. The crew was able to execute a successful emergency landing with an 8ft x 12ft section of the upper fuselage missing from aft of the forward entrance door to the leading edge of the wing. One of the flight attendants was swept overboard and killed. The aircraft was the second highest cycle 737 in the world at 89,193; the highest also being in the Aloha fleet. The original design life of the 737 was 75,000 cycles but this had been increased to 130,000 in 1987. However Boeing had been expressing concern at the condition of three high cycle Aloha aircraft since 1987. The NTSB blamed Aloha for failure to detect fatigue damage and an inadequate maintenance policy. Aloha voluntarily scrapped the other two aircraft in July 1988. The flight was cleared to the CU NDB for an ILS approach to Runway 35. After passing the NDB the pilots switched to ILS and thus couldn't verify their position in the procedure turn. The aircraft was outside the 35deg sector of the ILS centreline and the crew followed the wrong side beam. The crew descended to Outer Marker altitude and the 737 struck a hill. PROBABLE CAUSE: Presumed NDB passage, wrong use of VOR and ILS, overconfidence of the Captain and considerable inactivity of the First Officer (PF). All five crew members and 11 passengers were killed. While descending during a daylight approach in good weather, the crew lost control of the aircraft and crashed into the Andanan Sea. All of the nine crew members and 74 passengers were killed. The airport had no radar and the crew were concerned that another aircraft was behind them flying 500ft lower, on a different VOR radial, and was cleared to land. During this distraction the aircraft stalled and was unable to recover before hitting the sea. The controllers were re-assigned and their supervisor disciplined. The aircraft was approaching Runway 27 which had an 880m displaced threshold due to construction work. The pilot was landing into sun and touched down 520m short of the displaced threshold. The nose-gear collapsed as it hit obstacles and the aircraft broke in two. A fire broke out 30mins later and destroyed the aircraft. One of the 27 passengers was killed. The aircraft was en route between Baghdad, Iraq and Amman, Jordan when hijackers set off a hand grenade in the passenger cabin and started a gunfight with security forces on board the aircraft. An emergency descent was initiated immediately. Descending through FL160, a hand grenade in the cockpit exploded. The aircraft crashed trying to land at a small airfield near Arar Saudi Arabia; it broke in two and caught fire, killing 67 of the 107 passengers. 25 Oct 1986; N752N, 737-200, 19073/90, FF 27 Oct 68, Piedmont Airlines; Charlotte, NC. Flight 467 landed on Runway 36R after an ILS approach. About 24 seconds after touchdown, the aircraft overran the runway, struck a localizer antenna array, a concrete culvert, continued through a chain link fence and came to rest upon the edge of railroad tracks, 440ft past the runway end. Three passengers sustained serious injuries, but there were no fatalities. Passengers were disembarking when the airport came under attack from Iraqi aircraft and the aircraft was hit. Three passengers were killed. A nose gear tyre had reportedly burst during the first attempt to land. The aircraft went around and crashed into the sea 12 miles North of Makung. All six passengers and seven crew members were killed. The crew unknowingly tried to take-off from a taxiway in fog. The take-off was aborted, but the aircraft overran, collided with a dyke and broke in two. One of the 60 passengers was killed. The aircraft was hijacked to Malta. After several hours of negotiations, Egyptian troops stormed the aircraft. During the ensuing battle, the hijackers threw several hand grenades. The aircraft was severely damaged by the explosions and fire. Two of the six crew members and 58 of the 90 passengers were killed. The aircraft began its take-off from Runway 24 at Manchester with the First Officer handling. About 36 seconds later, as the airspeed passed 125 knots, the left engine suffered an uncontained failure, which punctured a wing fuel tank access panel. Fuel leaking from the wing ignited and burnt as a large plume of fire trailing directly behind the engine. The crew heard a thud, and believing that they had suffered a tyre-burst or bird-strike, abandoned the take-off immediately, intending to clear the runway to the right. They had no indication of fire until 9 seconds later, when the left engine fire warning occurred. After an exchange with ATC, during which the fire was confirmed, the Captain warned his crew of an evacuation from the right side of the aircraft, by making a broadcast over the cabin address system, and brought the aircraft to a halt. As the aircraft turned off, a wind of 7 knots from 250° carried the fire onto and around the rear fuselage. After the aircraft stopped the hull was penetrated rapidly and smoke, possibly with some flame transients, entered the cabin through the aft right door which was opened shortly before the aircraft came to a halt. Subsequently fire developed within the cabin. Despite the prompt attendance of the airport fire service, the aircraft was destroyed and 55 of the 137 persons on board lost their lives. The cause of the accident was an uncontained failure of the left engine, initiated by a failure of the No 9 combustor can which had been the subject of a repair. A section of the combustor can, which was ejected forcibly from the engine, struck and fractured an under wing fuel tank access panel. The fire which resulted developed catastrophically, primarily because of adverse orientation of the parked aircraft relative to the wind, even though the wind was light. The major cause of the fatalities was rapid incapacitation due to the inhalation of the dense toxic/irritant smoke atmosphere within the cabin, aggravated by evacuation delays caused by a door malfunction and restricted access to the exits. Shortly after starting a descent to 3000ft the crew reported that they were not receiving the DME. ATC asked if they would prefer a VOR approach to Runway 09 instead of a visual to 27, although it was night (23:25 local), the visual approach to 27 was continued. Later the crew reported that they had lost both engines and were descending through 3400ft and had nearly hit a mountain. The aircraft eventually hit high ground at 800ft and was destroyed by the impact and subsequent fire. The crash killed all four passengers and seven crew members. When taxiing out for a flight to Garoua via Yaound‚ a compressor disc in the No.2 JT8D-15 engine failed. Debris punctured the wing and fuel tank, causing a fire. The aircraft burned out. Two of the 108 passengers were killed. An explosion occurred in the rear cabin whilst climbing through 8000ft after take-off. The crew retuned to Huambo for an emergency landing but were unable to extend the flaps because of damage to the hydraulic systems. The aircraft landed flapless and fast and overran the runway by 180m. No fatalities. About 20 seconds into the take-off roll, at an airspeed of 70 knots, the flightcrew heard a loud bang which was accompanied by a slight veer to the left. The No1 engine 13th stage compressor disc had failed 1,300 feet into the take-off roll. A piece of the disc punctured a fuel cell which ignited instantaneously and the fire engulfed the left wing and aft section of the aircraft. The Captain immediately rejected the take-off using brakes and reverse thrust. Both the pilots suspected a tyre on the left main landing gear had blown. While the aircraft was vacating the runway, the crew noted that left engine low pressure unit rpm was indicating 0 per cent. The purser then entered the flight deck and reported a fire on the left wing. It took approximately 1min 30secs for the crew to initiate the evacuation. There were 119 people on board, but no casualties. The aircraft took off and climbed to 200ft before turning steeply to the left and crashing about 800m from the end of the runway. The crash killed all five crew members and 121 of 126 passengers. Angolan authorities blamed technical failure; however, anti-government guerrillas claimed to have shot the aircraft with a surface-to-air missile. Crashed during approach into Abu Dhabi after a bomb had exploded in the baggage compartment. The crash killed all six crew members and 105 of 111 passengers. There were indications of a pre-impact explosion in a cargo hold, with resultant structural damage and an uncontrollable fire producing toxic fumes that rapidly overcame the occupants. The evidence pointed away from a blaze of either electrical or fuel origin, and it was later concluded that the 737 had been sabotaged. Some checked-in luggage was carried by a ticket holder who did not board the aircraft. The aircraft struck a ridge with its tail section during an approach in fog and then crashed into hilly terrain approx 1 mile short of the runway. The crash killed all eight crew members and 111 passengers. The pilot was reportedly “under-qualified”. While on final approach at night, the pilot reduced engine power to flight idle. At 230ft (70m) the pilot added some power, but the airspeed had decayed below Vref. The stick-shaker activated and full power was applied. The 737 touched down 400m short of the runway, causing the undercarriage to fail. PROBABLE CAUSE: Misjudged speed, distance and altitude. Contributing factors were the inadequate crew supervision and the non-use of VASIs. There were 110 people on board but no fatalities. The First Officer lost control of a simulated engine failure after take-off during a training flight. The retarded thrust lever was advanced, but the engine stalled. The Boeing then rolled left and crashed. PROBABLE CAUSE: Failure to follow procedures, attempted operation with known deficiencies and inadequate supervision were factors. Both pilots were killed. The crew made a crosswind landing on Runway 22 with a wind of 300/12, the speed at touchdown was Vref+6kts. The aircraft bounced and landed back. When the spoilers and reversers didn't seem to operate, the crew shut down both engines, thus making it impossible to use the anti-skid system. The inner tyres on both main gear legs burst almost simultaneously at 125m short of the runway end. The aircraft skidded to the left, overran the runway and came to rest 145m further on. The aircraft caught fire after the evacuation. No fatalities. The aircraft landed heavily in a rainstorm and broke in two. One report stated that “The pilots’ misuse of rain repellent caused an optical illusion”. The crash killed two of the 112 passengers. The crew used reverse thrust to assist the push-back off stand and taxied close behind another aircraft for heat from the exhaust, both of which may have contributed to the airframe snow/ice accretion. They also did not use engine anti-ice whilst taxiing out during snow causing the PT2 (EPR ) probes to misread. Although anomalous engine instrument readings were called during the takeoff, the Captain neither aborted nor adjusted the thrust levers to allow sufficient thrust for takeoff and the aircraft stalled and crashed into the frozen Potomac River. Take-off was almost an hour after de-icing had been completed and the CVR shows that the crew were aware of 10-20mm of snow on the wings. Four of the five crew members and 70 of the 74 passengers were killed. The aircraft experienced in-flight structural failure at 22,000ft. The crash killed all six crew members and 104 passengers. The aircraft had experienced rapid depressurisations 2 weeks previously and that morning. The aircraft was the one built immediately before the Aloha 737 which ripped open in-flight. The cause was found to be serious belly corrosion, exacerbated by the fact that the aircraft had been frequently used to carry fish in the hold. The first 418 737s were susceptible to structural problems as they were built with a production method of stiffening with bonded doublers (cold bonding). This was changed to chemical milling. The crew had received a clearance for a visual approach to Runway 19R. Meanwhile the controller cleared another flight for take-off from the same runway. When recognising the hazard, the controller ordered the landing aircraft to go-around and the departing aircraft to abort its take-off. The departing aircraft rejected its take-off, but the Captain of the landing aircraft delayed the go-around by approximately 12 seconds and then selected the gear UP before achieving a positive rate of climb. The 737 left the runway surface at 900ft past the threshold and skidded another 1170ft before coming to rest 115ft to the right of the centreline. No fatalities. The aircraft landed 4m short, causing the gear to collapse. The aircraft slid 900m and came to rest 20m to the side of the runway. The no.1 engine and right wing caught fire. The aircraft was destroyed during recovery attempts. PROBABLE CAUSE: Lack of VASIs and threshold markings caused the pilot's inability to follow the correct approach slope. The aircraft lifted off from Runway 09, but could not climb because the leading edge devices did not deploy and as a result the aircraft became aerodynamically unstable. The take-off was aborted and the aircraft was flared for a belly landing with undercarriage retracted. The aircraft belly landed in nose up, left wing low attitude, on the centre line of the runway. It slid for 3080 feet, hit a boundary fence, crossed a drain and ploughed in rough terrain negotiating with small boulders and came to rest. Fire broke out on impact. One passenger and 3 maintenance workers cutting grass were killed. The aircraft was performing circuits on a training flight. During a touch-and-go on Runway 25, the aircraft struck a flock of birds. The take-off was aborted, but the aircraft overran, struck the localiser antennas and skidded. The right main gear collapsed and the no.2 engine was torn off in the slide. The aircraft came to rest 300m past the runway end and was destroyed by fire. There were no fatalities. During landing in darkness and fog, on their last flight of the day, the crew forgot to lower the gear. The aircraft landed on the runway and skidded for about 2000 ft before it veered off the side and came to rest in grass. The aircraft collided with small trees on its path sustaining damage to both engines, forward and mid fuselage and horizontal stabilizers. No fatalities. The aircraft touched down just as the crew noticed a snow blower on the runway. A go-around was initiated, but the thrust reversers did not stow away properly because hydraulic power was automatically cut off at lift-off. The aircraft missed the vehicle, overran the runway, crashed and burned. Estimated time of arrival given by Calgary ATC was considerably in error. Crew did not report over the final approach beacon. The crash killed four of the crew members and 38 of the 44 passengers. The flight was approaching Kuala Lumpur when the pilot radioed that a hijacker had taken control of the aircraft. The aircraft continued to Singapore. While descending from FL210 to FL070 the nose suddenly pitched up. Control was lost and the aircraft crashed into a swamp and disintegrated. All seven crew members and 93 passengers were killed. Both pilots had been shot. 31 Mar 1975; N4527W, 737-200, 20131/165, FF 7 May 69, Western Airlines; Casper, WY, USA. The Captain was flying a back-course localizer approach to Runway 25, even though a full ILS was available on runway 07. The weather was 500ft cloud base with visibility less than 1 mile in light snow and a slight tailwind of 030/08. The runway had been ploughed earlier but there was now an estimated 2-3 inches of snow on the runway. The aircraft levelled off at MDA with flap 25 set. After 4 sec the F/O became visual and selected flap 30 at the Captains request who descended toward the runway. The aircraft remained high and fast until touchdown and no advisory/warning callouts were made by the F/O. He touched down 2375ft into the 8681ft runway at Vref+20 and ran off the end by 800ft hitting the approach lights at the far end. Aircraft sustained substantial damage but there were no fatalities. The aircraft was making an NDB approach with visibility below minima, but the crew continued the approach and descended below minimum descent altitude without seeing the runway. The aircraft collided with high tension wires, crashed and caught fire. The crash killed five of the seven crew members and 43 of the 58 passengers. Aircraft crashed in a residential area about 1.5 miles from Runway 31L during a non-precision approach. The aircraft was observed below the overcast in a nose-high attitude and with the sound of high engine power just before it crashed into structures on the ground. It is believed that the aircraft was in the landing configuration but with the flight spoilers still deployed after a deceleration which caused the aircraft to stall. 3 of the 6 crew, 40 of the 55 passengers and 2 people on the ground were killed. 19 Jul 1970, N9005U, 737-200, 19043/18, FF 29 Feb 68, United Airlines; Philadelphia, USA. The First Officer (PF), initiated the takeoff roll. Shortly after rotation, at a speed above V2, a loud bang was heard and the aircraft veered to the right. The Captain moved both throttles forward but there seemed to be no response. The Captain then made the instantaneous decision to land back on the runway. The aircraft touched down 1075ft before the end of the runway, it overran and continued across the blast pad. It crossed a field, passed through a 6-foot high aluminium chain link fence into an area covered with high grass, weeds and brush. The aircraft came to rest 1634ft past the end of the runway. The NTSB report states the cause as: “The termination of the take-off, after the No.1 engine failed, at a speed above V2 at a height of approximately 50 feet, with insufficient runway remaining to effect a safe landing. The Captain's decision and his action to terminate the take-off were based on the erroneous judgment that both engines had failed.” There were no fatalities.